I wanted to put up the bass aria from St. Matthew’s Passion that I’ve been listening to over and over and over again. It’s the song that made me post “music so beautiful it hurts.” But I’m having technical difficulties. I think it’s too big or something. This is the name of the aria: Mache Dich, Mein Herze, Rein. It’s performed by the Bach-Collegium Stuttgart & Helmuth Rilling, and I found it at the Apple Music store after listening to a billion different versions. The singer’s name is Thomas Quastoff. Take advantage of my research. Go get it. It’s only 99 cents. 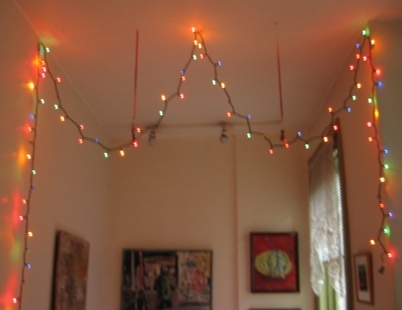 In the meantime, I give you the Christmas lights that hang in the back of my apartment. Is that like church music or something ? You seen that Jane Jacobs died today. If not for her, the West Village might’ve been history. In my house, Bach rules, bigtime. Thank you for the tip. You can’t go wrong for 99 cents. As for Christmas lights…when I married a widow in 1994, the old Victorian house in which she lived had Christmas lights in the library, strung across the ceiling. They were put up by her late husband and they just stayed up there for the longest time. After awhile, it just seems normal to have Christmas lights up year ’round. Even in the summer. Yeah, I grew to love having Christmas lights up all year round, too. They’re so pretty. And yeah, sad about Jane Jacobs. We so owe her.